I use a lot of spice in my cooking, so a grinder is a useful piece of equipment. I did a fair bit of research on various grinders, finally deciding to purchase the James Martin, Wahl ZX595 Mini Grinder. It does the job very well. The only gripe that I have with it, is the fact that you can not remove the blade. This makes cleaning the inside a fiddly job. It is not an issue if you only use it for grinding a single product, say coffee beans, but I use it for a number of different spices, and spice mixes so I like to be able to give the grinder a thorough clean in-between uses to eliminate aromas and flavours. Having said that, I do like the product, it’s powerful, and I give it 7/10. 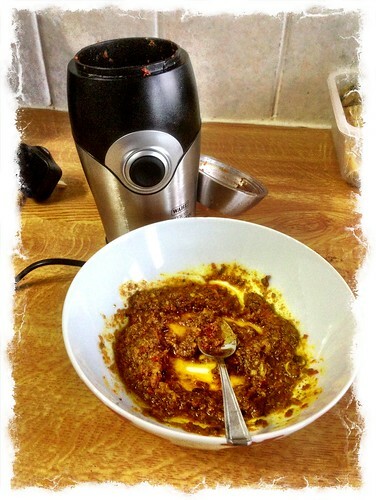 This entry was posted in Kitchenwares and tagged James Martin, Wahl, ZX595 Mini Grinder on October 8, 2013 by Richard.